January, we discussed the effects of a historic snowfall on Ada County’s real estate market, which is quite different from recent stories about the mild winter helping boost new construction. But despite builders being able to work when they normally cannot, it hasn’t been enough to push new inventory higher than it was last year. Homeowners are also not listing quickly enough to raise existing inventory levels, reasons for which are discussed in BRR’s 2017 year-end market report. Looking at these numbers, we see there were more pending sales in January 2018 than the number of homes for sale, both in the existing and new construction segments (figures above are combined). This happened in early 2017, as well, and can occur because homes usually don’t close in the same month they are listed since it can take 30-90 days to do so after an offer is accepted. So, when inventory is very low, there can be more homes under contract or pending, than available for purchase. It’s remarkable that we’re seeing pending sales outpace inventory for new construction, too, especially considering the weather has been more favorable for building this winter. These numbers further reinforce the tremendous growth and demand for housing in our area. 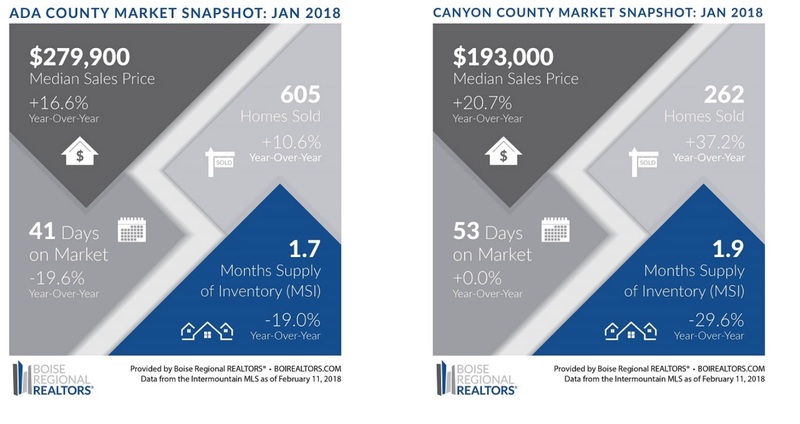 The result of this very low supply compared to the very high demand, is that the Ada County median sales price hit a new record high of $279,900 in January 2018, up 16.8% from January 2017. The numbers above represent Ada and Canyon Counties. Do you need help deciding if it’s the right time to buy? We are very happy to get you that information. Call our office at 208-472-5315.